Remember that vegetables, meat, fish, and poultry (low acid foods) should be pressure canned for safety. Fermented vegetables and fruits (acid foods) can be canned in a boiling water bath. Note that figs and tomatoes should be acidified. Always start with a tested recipe before canning. Tested recipes can be found in the So Easy to Preserve book. Canning Coaches can refer to the resource list in their notebooks for more reliable resources. If no tested canning recipe exists for a product, freeze it for extended storage!!! Another option is to dry it. 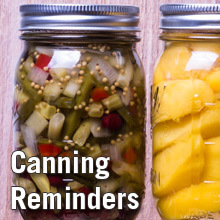 If low-acid foods are being combined with high-acid foods, pressure canning is the correct and safe method to can. For example, pressure canning is required when combining ingredients such as lima beans and corn (both low-acid foods) with tomatoes (which when canned by themselves can be acidified and canned by a boiling water bath process). Use the process for the vegetable that requires the longest pressure canning time. Remember that tested canning recipes are developed for altitudes of 0 to 1,000 feet. Adjust canning processes for altitudes above 1000 feet by following the recommendations in So Easy to Preserve or other reliable resources. Jam and jelly recipes should never be doubled. Always make jelly or jam in quantities stated in the recipe. Doubling or tripling a recipe causes boiling of the fruit juice to take longer resulting in loss of flavor and darkening and toughening of the product. Longer boiling also adversely affects pectin’s ability to form a gel. Keep in mind that if the boiling water process time for a recipe is less than 10 minutes, jars need to be sterilized. Check a tested recipe for the correct processing time. One of the most important things canners and cooks can do to prevent the spread of germs is to wash their hands.The kitchen is no exception! Wash hands often under hot water with lots of suds for ~20 seconds when handling food.